In collaboration with Christophe Gressins. One common practice in wedding photography is to use two different cameras in order to easily shoot using two different fixed-length focal lenses, which can result in significantly different renderings. In this tutorial, we will show you how you can standardize a series of wedding photos that have been shot using two different cameras. We will pay special attention to DxO OpticsPro’s Color rendering tool, which offers some particularly interesting options, and then we will address copying and pasting correction settings. 1 – Why standardize a series of wedding photos? 1- Why standardize a series of wedding photos ? Professional photographers are used to dealing with the practical challenges of wedding photography. The goal is to deliver a consistent, uniform series of images to one’s clients, which requires that the photos have a similar rendering, particularly when it comes to color. After the photos are taken, however, it’s common to discover that there are significant differences in color among the images. —And for good reason, given that the photographer (and possibly an assistant or trainee) may use several different cameras and take several series of photos during the same wedding event. This means that a series of shots can contain photos with very different, disharmonious color renderings — and this is where standardizing comes in. You should base the rendering to apply to your series of photos on the rendering of your principal camera. 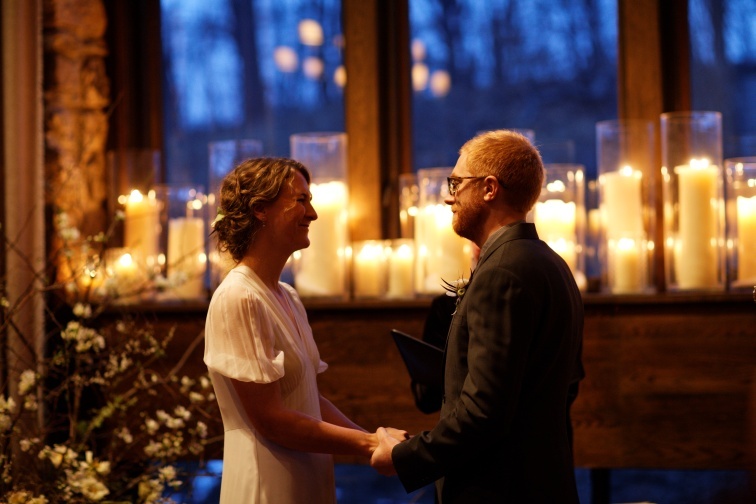 For example, you will likely use the same camera for photographing all of the wedding guests with the happy couple – an essential moment — and thus the rendering will be the same for the entire series. You can then apply this same rendering to all the other wedding photos so as to standardize them all. A RAW file has to be converted before we can view it on a screen, and it is this conversion process that determines the color rendering. Every camera brand —indeed, every camera model provides a specific default color rendering that is intended to match what the manufacturer considers to be the users’ expectations. 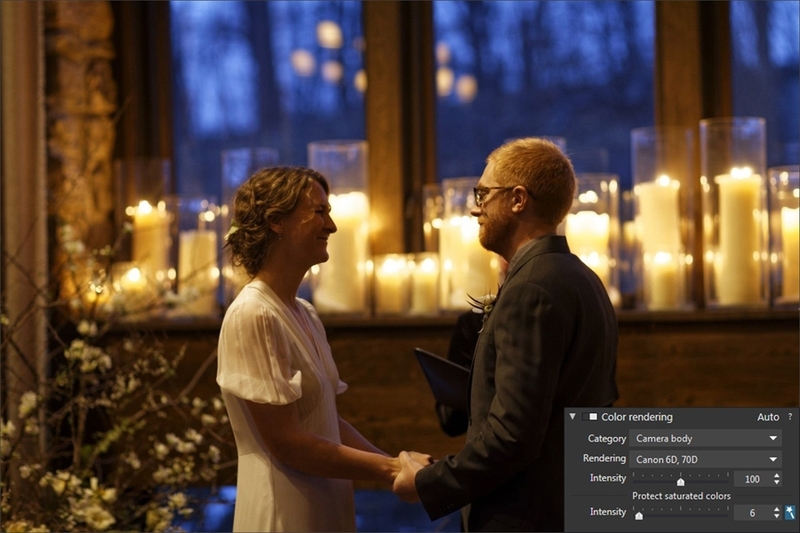 This is the color rendering that DxO Optics Pro applies during the conversion of RAW files. Thus two photos of the same scene taken under the same conditions, but with two different cameras, will produce two different color renderings when processed with DxO OpticsPro. 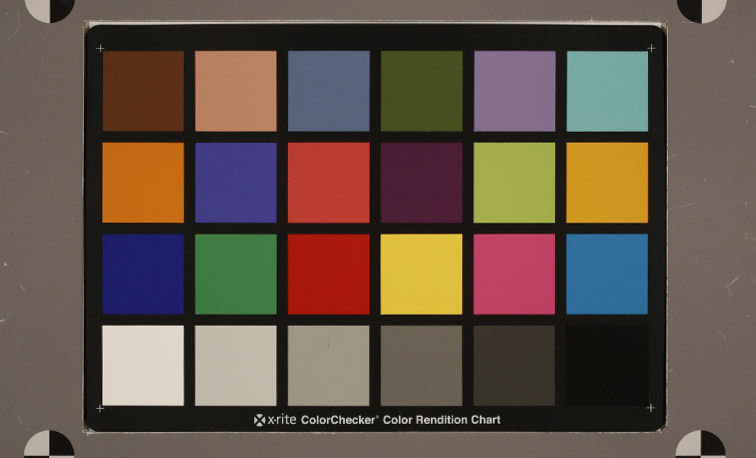 This said, color rendering is not in and of itself an intrinsic characteristic of a camera or sensor. 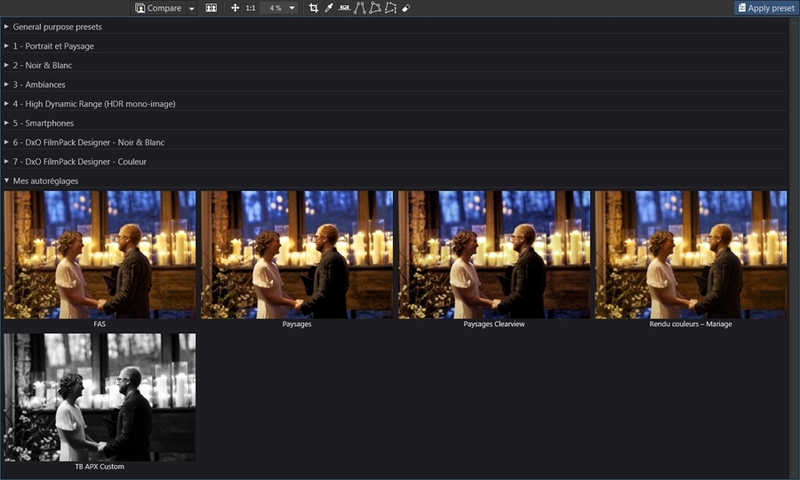 It is only during image processing that a color interpretation is applied, so it is therefore perfectly possible to use DxO OpticsPro to apply the rendering of any camera to RAW image files produced by a different camera. Thanks to DxO OpticsPro’s Color rendering palette (under Light and Color – Advanced ), you can choose the color rendering type of the principal camera you used for shooting and apply it to a photo taken with a different camera. For the remainder of this tutorial, we will explain how to standardize a series of photos based on the color rendering of the reference camera. For more creative renderings, you can consult our tutorial on using DxO FilmPack with your travel photos by clicking on this link. For maximum efficiency, we recommend that you work on the color rendering for a single photo that is representative of the entire series, and then apply that rendering to the entire series. We also advise you to manually correct the white balance for this reference image so as to be able to apply the setting to the other images, regardless of the white balance mode used during shooting. The other settings (correction of keystoning/horizons, noise reduction, sharpness optimization, etc.) should be applied during a second pass-through, and possibly on a photo-by-photo basis, depending on the image content and shooting parameters. 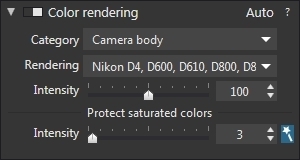 Choose the Camera Body option from the first drop-down menu in the Color rendering palette. 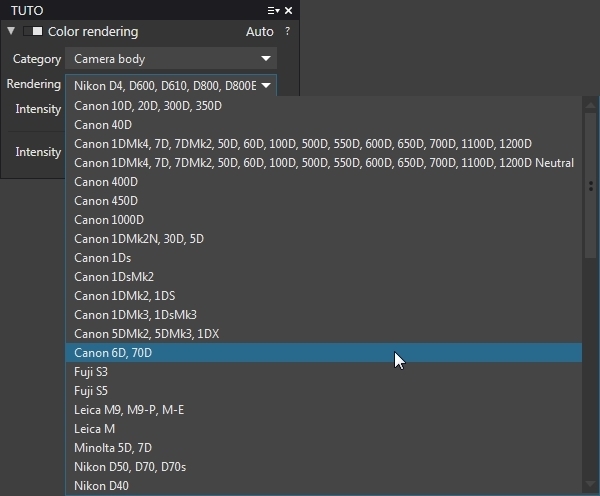 You can then select a color rendering that corresponds to one of the cameras on the list and apply it to your photos, regardless of the camera you actually used during shooting. Each camera produces a different color rendering. If you want a profile that is as neutral as possible, you can use one of the available generic renderings, regardless of the camera you shot with. To do so, choose the Generic renderings option in the first drop-down menu, then select one of the available renderings. In our example, we will apply the Canon 6D camera rendering to all the photos in the series, because some of the images in our series were taken with this camera. The other photos in the series that were taken with a different camera will thus also end up with a color rendering similar to the photos taken with the Canon EOS 6D. One you have selected the profile, you can adjust the effect of the rendering with the Intensity slider under the two drop-down menus in the Color rendering palette. By default, this slider is set at 100; if you increase the value by moving the slider to the right, you will amplify the effect of the rendering. You can also decrease the value (and thus the intensity of the effect) by moving the slider to the left. To perfect the rendering of your image, you can adjust the level of color saturation with the Protect saturated colorsslider. A DxO OpticsPro exclusive, this tool lets you restore the textured details in the colors that are at the edge of clipping (with resultant loss of information). If you would like to learn more about this feature, you can consult the tutorial about mastering color saturation with DxO OpticsPro 10 by clicking on this link. Now that you have defined the color rendering for the series, we will now show you how to reproduce it so you can apply it to multiple photos. For our example, we will assume that all of the images in the series are stored in the same folder. If this isn’t the case, then you should start by creating a project into which you can gather all the photos that you want to process. Now that you have chosen the rendering to apply to the whole series, you can copy the correction settings applied to the reference photo and apply them to the other photos. To do so, all you need to do is select Copy Correction Settings from the Image menu. You can also access this option by right-clicking on the displayed image (PC only), or by right-clicking on the thumbnail in the image browser. This feature stores all of the corrections made to the photo, which is why we advise you to first work only on the color processing, and then make a second pass through to deal with the other correction settings. In the image browser, select the photos in the series to which you want to apply the same color rendering. Depending on how many photos you choose, you can proceed in several different ways. To select a continuous series of images, click on the first image in the series, and then click on the last image in the series while holding down the SHIFT key. To select multiple non-continguous image files, click on the first image, and then hold down the Ctrl key (PC) or the Cmd key (MAC) as you click on each additional photo to include in the selection. If you want to select all of the photos displayed in the image browser, simply select an image and then press Ctrl+A (PC) or Cmd+A (MAC). You can also select the entire series as in the previous case, and then deselect undesired photos by clicking on each one while holding down Ctrl key (PC) or Cmd key (MAC). We now have a selection of photos to which we want to apply the color rendering that we have previously defined. To apply the correction settings, simply select Paste Correction Settings from the Image menu. The corrections will be applied to all of the selected photos..
You can also apply these correction settings to photos in a different folder. 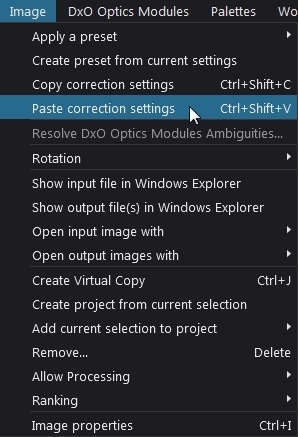 To do so, simply open the folder, select the desired images, and then select the same Paste Correction Settings option in the Image menu. 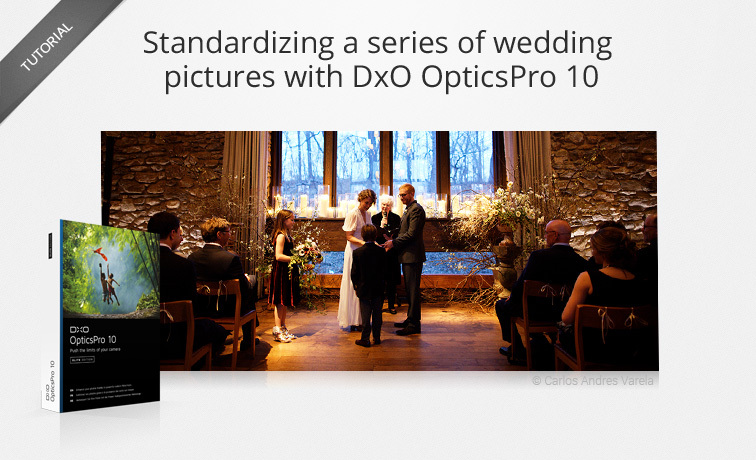 Once you have defined the color rendering and thus made it available to be applied to other images, DxO OpticsPro 10 offers an alternative to copying & pasting the correction settings: presets. We can save the color rendering settings that we chose for our reference photo as a preset. To do so, simply select the Create preset from current settings option in the Image menu. You can now use this preset to apply these settings to other image series. All you need to do is select the photos and then choose your new preset from the Images > Apply Presets menu in the toolbar. We will provide a more detailed explanation of how presets operate in a subsequent tutorial.